On April 24 at approximately 2:00 a.m. Calcasieu Parish Sheriff’s Office deputies responded to call at a local hospital in reference to a possible cruelty to a juvenile. Upon deputies’ arrival they were advised by hospital staff that a 4 month old baby boy was brought in with a brain bleed. Detectives were advised by several doctors that their examinations and tests concluded the injuries the child sustained were non-accidental. 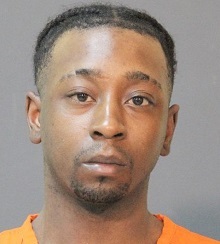 On April 27, after further investigation, detectives spoke with the baby's mother's boyfriend, McKeithan D. Frank, 21, Lake Charles, who was babysitting the 4 month old prior to him being brought to ER. Frank admitted to detectives that he struck the child’s head against the kitchen bar. He was arrested and booked into the Calcasieu Correctional Center and charged with 2nd degree cruelty to a juvenile. Judge David Ritchie set his bond at $150,000. The baby was transported to a hospital out of town, where he underwent emergency surgery and is currently listed in stable condition.